Please be aware this review looks at just one electric toothbrush from Fairywill. There are similarities across these models, but the naming convention for these brushes is complicated, to be sure to take care in picking the right one for you. If you want more detail, you can read our full Fairywill FW-917 review further down the page, or watch our review video. No, there is most certainly nothing drastically wrong with this brush at all, particularly when you consider the price. We currently rate it as the best budget electric toothbrush. The biggest problem with this brush is the question of who are Fairywill?! A Chinese firm they do not have the recognition of brands like Sonicare and Oral-B but if they continue to produce products like this then they should. Refreshing as it is to see a new brand and contender within the electric toothbrush market, the resulting clean could be better, as could the length of the support. We delve into these issues further in our Fairywill vs Sonicare & Oral-B post. However, if like me you would like the peace of mind of a better known brand, you should consider the Sonicare ProtectiveClean 4100 or the Oral-B Pro 1000. Amazon is the only retail outlet through which you can purchase this sonic electric toothbrush at the time of writing, but you can also check out eBay if you prefer that. It is manufactured in China, but is available for dispatch within the USA. Fairywill are a Chinese manufacturer of electronic products or so it would seem from doing a bit of research on them. They are not a brand I am familiar with and seem to be a new entrant to this space and have already made available a variety of different electric toothbrush models. Quickly they have risen to be one of the most popular electric toothbrushes available from Amazon today, but whilst the features v the price is extremely favourable you have to consider whether this purchase is best for you. Depending on your expectations for the price, initial impressions when you get the Fairywill sonic toothbrush in hand is pretty good. For a start the packaging is a lot smaller than many of the other brands with a good number of items included for the price. The box is smart with a run down of what’ is included and the brush features. 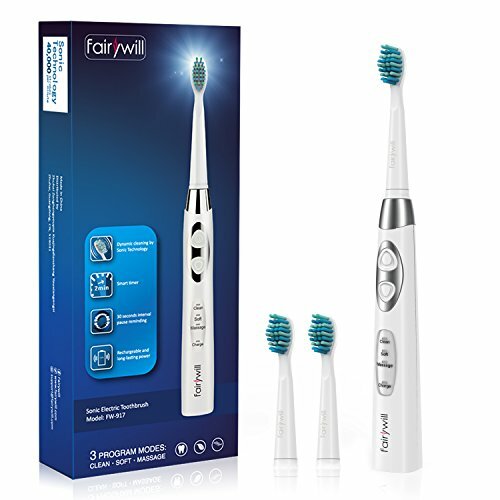 According to the box, with the Fairywill can remove 100% more plaque within 1 week, improve gum health in just 2 weeks and achieve noticeably whiter teeth in just 2 weeks, when compared to a manual brush. Super, all sounds good, if only it was clear how they have come to this conclusion. These are claims seen by other leading brands who have at least at some point conducted some clinical studies. With some digging you can find their supporting evidence, Fairywill lacks this. They also show the FDA logo which is that of the US Food and Drug Administration. They have registered with the FDA here. I am unclear what checks have been performed into product safety etc and whether they can display such a logo on the box. To my knowledge they have simply asserted their intention to sell this product within the USA. Not shown on any of the promotional images on on the outer box is the inclusion of an interdental brush head. This is a style of head that can be purchased separately. Inside the brush is the motor, the electronics and the battery. This technology is during the manufacture pushed in from the bottom of the brush handle. There appears to be some gaps around the bottom edge. Whilst not overly concerned I am not sure how long term this will handle any water ingression. The brush is said to be ‘waterproof’ but with an IPX7 rating it is a resistance rather than waterpoof. A rinse under the tap and maybe use in the shower is fine. Avoid complete immersion in water at all costs. Also included in the box is a small plastic cover that can be placed over the brush head when not in use/ it can kind of act like a travel cap. There is too the option to purchase a pack with hard bristles if that is your preference (view on Amazon). The recommendation is usually to go for the softer option. Included was the interdental brush head which was a little strange and can be best described as a bristled head that has been shaped to a point. I found it a bit odd and can’t see it replacing my flossing routine or even the interdental brushes that I use. I get the principle of it though, some may like it. A pack of 2 interdental heads (view on Amazon) will set you back $7, so they are a bit pricier than a standard head. The psychical size of the Fairywill brush head is larger than that of Oral-B’s round heads but appears smaller than Sonicare’s larger brush heads. It should fit for most people to the hard to reach areas in the mouth. The charging stand included is one of the smallest I have seen. I like the compact form factor. Built quality is just ok, it looks and feels a little cheap. The brush motor offers a sonic technology with a maximum 35,000 strokes per minute. This maximum power and movement is felt on the Clean mode. Soft mode has movements of 28,000 per minute, whilst Massage fluctuates between 28 and 35,000. Even Oral-B brushes that retail for upwards of $80 do not offer this. During the 2 minute cleaning cycle, a timer in the brush keeps track of what is going on. At 30 second intervals the brush will provide an audible and psychical warning via a slight pause in the brush motor at to tell you to change quadrant. This is your built in pacer. The brush is louder than a sonicare brush, but quieter than an Oral-B in everyday use. When it comes to the actual clean I have conducted no scientific tests. My mouth felt cleaner, as it should after the clean, but I did not feel as great about the cleanliness of my teeth as a I do when using an Oral-B brush. Maybe the Oral-B is a bit harsher or creates a feeling of being better than it is, but I feel more refreshed after use with that. This may also be partly backed by my concern of how engineered is the brush and the bristles. How good a clean do they really offer? I am more than happy for brands like Fairywill to come in an encroach on the market share that big brands occupy, I think there is the need for competition. However, some may struggle to have overall confidence in the product when things like the user manual is not written all that well. Not that you would expect it but the brush has no Bluetooth connectivity/smart features, a full sized travel case or any brush head storage is not included. To put this into perspective, the Genius Pro 8000 from Oral-B is one of the most popular brushes is about 7 times the price and its battery lasts . It’s battery life is 48 minutes, which is equivalent to 12 days. The only retailer the Fairywill FW-917 is available from is Amazon, but you can also check out eBay if you prefer to shop there. Just $19.99 is the cost of this Fairywill FW-917 as the time of writing. For $20 can you really complain?! This is a good price, no questions asked. Even if it did not offer the battery life and cleaning modes that it does. Oral-B’s closest rival is around $40, offers a fraction of the battery life and 2 less cleaning modes. The brush heads for this model are available in packs of 4, retailing at $8. This makes them just $2 each. Some might say this is a little expensive given the cost of the brush itself, a new head is 10% of the purchase price. But, you do get 3 brush heads in the box, where typically you would get one so there are some cost savings here. Using the average cost (based on one user) and ownership over 3 years the Fairywill will cost $36 or $0.03 cents per day to own. This is by far one of the cheapest electric toothbrushes to date. However, when you consider my comments regarding potential reliability, it may be worth pricing this brush over a shorter time period. Even then, it does still come out as an excellent value option. Unlike the Sonicare and Oral-B brands where there is a history of products and reliability we have nothing to go on here. My initial feelings are the Fairywill will not fare so well. For a start it comes with a 1 year warranty compared to the 2 year offered by the other brands. My biggest concern is the sealing, particularly around the base of the brush, there are obvious gaps, I am assured however this is normal, fine and the brush is still water resistant. Claimed to be waterproof, the product is most likely water resistant as the manual says do not soak the product in water for a long timer. During my testing the brush continued to work but this is one of the first brushes that I can’t confidently say will stand the test of time. Unlike the 2 year warranties offered by the big brands, Fairywill offer just 1 year. If you are not bothered about the brand and want something cheap yet incredibly functional then the Fairywill FW-917 will serve you really well indeed. For me, I recommend this brush with caution. Personally I would be very tempted to spend a little more to get a more tried and tested brand and model, Such as the Sonicare ProtectiveClean 4100 , but with the better models being at least double the price, you and I can afford for 1 to fail. No, it is a sonic toothrbush. Yes. Often referred to as the timer and quadpacer; the brush will provide an audible and psychical warning through a slight pause in the brush head mode to tell you to change quadrants. There are 4 quadrants to the mouth, and brushing is normally for 2 minutes. At the end of the 2 minutes the brush will automatically power off.. Yes, you can although we have highlighted our concerns with the resistance to water.. Avoid submerging it in water. No, a travel case is not included in the box, but a small plastic travel cap for the brush head only is included.You can purchase a Fairywill travel case here. I am pleased with the Fairywill rotary toothbrush (but this is my first so cannot compare. But, am ready to change the head and cannot get the current one out. Have tried twisting to the rift as suggested but won’t budge. Any suggestions? Glad you like the brush. Sorry to hear the trouble you are having getting the head off. I presume it is the same model that you have? It should be straight forward to twist and pull it off. Perhaps refer to your user manual that came with it, just in case the design has changed. Failing that perhaps ask a friend or family member to have a go. If you still can’t remove it contacting Fairywill might be the best option. Thanks for an honest review. I have two Oral B toothbrushes and really like them. However, I will be traveling to Europe (from the USA) for a month and both Oral B brushes require an adaptor and a heavy power transformer to charge. Since I want to travel extra light, I think I’ll purchase this Fairywill and use it as my travel toothbrush. I looked at a Quip but wasn’t convinced it was powerful enough. Plus I didn’t like wasting a battery. Charging via USB is a great option for traveling overseas. Glad the review was helpful Cookie. The Fairywill will make for a great travel toothbrush. You might not even have to charge it. The size, weight and the way it charge does make it very convenient for this.